A trip to Mt. Everest is a dream for many people. We have been fortunate enough to see Everest and the Himalaya on several occasions and I am sure there will be many more opportunities since we live in the area. For this travel adventure, I am going to write about a trip I made there in January 2006 with my good friend Brian. Enjoy! Brian came out in August 2005 to be a volunteer teacher at the NGO where I work. We both had a long winter holiday and wanted to take a trip during the break. My wife had to work so she wasn't able to make it (she went to Everest with me on a previous adventure). Brian was thinking of heading south to Thailand, but I threw out the idea of going to Everest. He didn't even have to think about it! Everest was where we were going. In Lhasa we contacted my good friends at the FIT travel office at the Banak Shol hotel (fit0891@hotmail.com ...by far the best travel agency in Lhasa). We arranged a 7 day trip by Toyota LandCruiser. We paid Y3700/$463 for the LandCruiser rental, driver and all necessary travel permits for the area. Our driver (Dhondrup) was a native of Lhasa and had made the drive to Everest over 200 times. 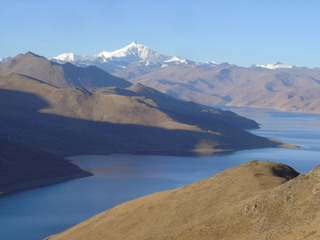 From Lhasa, our first destination was Yamdrok Lake, which is considered to be holy among Tibetans. Yamdrok is a beautiful lake that sits at almost 4500m/14,760ft. Mt. Nojin Kangtsang (7191m/23,587ft) sits in the distance. There is a mountain pass before you descend down to the lake. 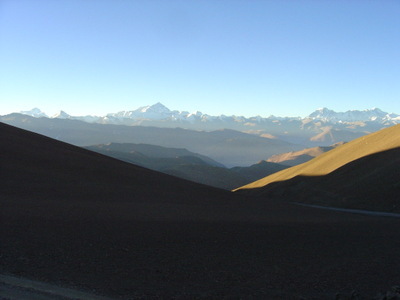 The Kam Ba pass sits at 4794m / 15,725ft. By the time we reached the pass, Brian was feeling the effects of the altitude. We stopped at the top and he threw up several times. By the time we actually got down to the lakeside (a drop of around 300m/985ft) he was feeling a lot better. From Yamdrok we made our way to Gyantse. Gyantse (elevation 3950m/12,957ft) is home to the Gyantse Kumbum, which is the largest stupa in Tibet. Gyantse was also the sight of a major battle against British soldiers in 1904. The Gyantse Dzong (fort) sits on a hill high above the town. 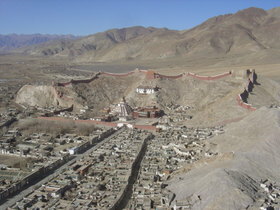 From the top of the fort, you get an excellent view of the Gyantse Kumbum and of the rest of the town. From Lhasa to Gyantse is 250km/156mi. We stayed just one night in Gyantse before heading to Shigatse. The next day we woke up early to head west to Shigatse. Shigatse is only 97km/61mi from Gyantse and takes about an hour to reach. Shigatse is home to the famous Tashi Lhunpo monastery. The Tashi Lhunpo monastery is the home of the Panchen Lama's. Shigatse is actually a city with over 75,000 people. 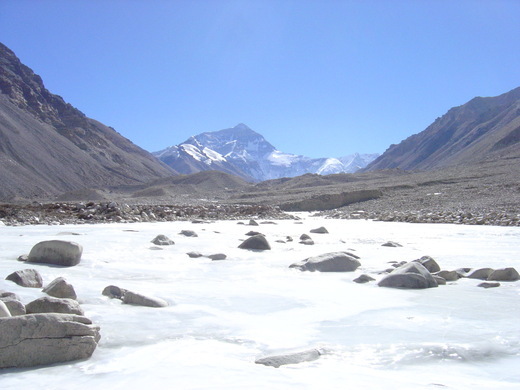 Even though it sits at 3900m/12,792ft, it is much milder in the winter than most places in Tibet. Brian and I spent 2 days in Shigatse wandering the streets. We actually found a hamburger restaurant in town called "Georgia Burger". We had dinner there one night and it wasn't too bad (of course I have been living in Tibet for over 4 years. I am pretty sure I have forgotten what a good hamburger should taste like). We stayed at the nice 3 star Manasarovar Hotel located on the east end of town. The winter rate of Y140/$17.50 was a bargain so we stayed there both nights. In Shigatse it is common to find Tibetans sitting around drinking "chang", a homemade Tibetan brew made from barley. You can buy a small glass of it all over town for around Y0.5/ $0.06. 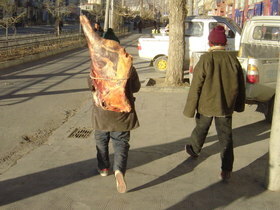 One day while we were out on a walk, Brian and I came across the guy pictured below hauling around a large slab of meat tied to his back. It made us laugh. From Shigatse, we made our way to the small town of Shegar. Shegar is 232km/145mi southwest of Shigatse and sits at an elevation of 3900m/12,792ft. About 20km/13mi before we reached Shegar, we got our first glimpse of Everest and the Himalaya mountains. The weather in in southern Tibet in winter is usually clear with bright blue skies. We had a flawless view of the mountains. It couldn't have been any better. We stopped and took many pictures of the Himalaya. 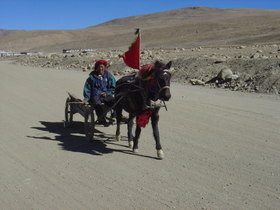 This region of Tibet is often traveled by horsecart. A couple of horsecarts passed us while we were taking pictures. Shegar is a very small town with basically nothing to do. We met all the locals in town within the first 5 minutes. We stayed at the comfortable Kongjong Guesthouse for Y25/$3 a night. We met some kids on the streets (I mean "street". The only "street" in town is the Friendship Highway that leads down to Nepal) that were selling fossils. The only English words these kids knew was "fossil". They kept following us around town trying to get us to buy one, so I ended up buying one of these fossils for Y1/$0.12. The kid promptly went over to a store and bought some candy. After about 10 minutes of being in Shegar, Brian and I were bored out of our minds. So we found some of our own "fossils" and tried to sell them in town (our "fossils" consisted of us drawing pictures of yaks and people on small rocks). For some unknown reason no one wanted to buy our "fossils". We then went down to a frozen river and invented games to play. I am pretty sure I won. Shegar is not a good place to stay if you like excitement...or electricity...or heat. I always sleep with a cup of water by my bed. That night in Shegar I woke up to get a drink of water. My water cup was frozen solid. That night it was -20C outside and our guesthouse had no heat. I just licked the ice and went back to sleep. The next morning we left for Everest. Since it was winter, we weren't going to camp at base camp (-25C/-12F or colder at night). We just wanted to go there and spend a half day or so. From Shegar to Everest base camp is about 110km/69mi. The road is good for a dirt road. It took our driver about 2 1/2 hours to get there. Along the way we crossed the Pang La pass that sits at 5120m/16,794ft. From this pass, you get an incredible sweeping view of the Himalaya mountains, including Mt. Everest. We stopped at the top and took many pictures. Since it was still early morning when we arrived at the pass, the temperature was extremely cold. It was difficult to stay outside, but it was worth it. From the Pang La pass we continued south to base camp. Along the way we passed the small village of Tashi Dzom where my wife and I stayed two years earlier. Less than an hour later we arrived at Rongbhu monastery. Rongbhu is the highest monastery in the world at 4990m/16,368ft. Rongbhu monastery has an excellent view of Mt. Everest. From Rongbhu it is only 8km/5mi to base camp. A few minutes later we arrived at Mt. Everest base camp. Even though I had been there before, I still was in awe and amazement. I was standing in front of the world's highest mountain! Brian and I got out and were shocked at how warm it was. Base camp sits at 5200m/17,056ft. With bright blue skies and a bright sun it actually felt quite warm even though it was January. Neither of us wore our big coats. We got out of the LandCruiser and started walking towards the mountain. In the busy summer months, there are many tourists at base camp everyday, but in the winter it is rare to see another person there. Brian and I were the only ones there on that January morning. We climbed up several small "hills" trying to get the best shot of Everest. We came across a small memorial area that was made in remembrance to those who died on Everest. On top of one of the hills, I actually had cell service so I sent some of my friends a text message.The night before in Shegar, we made a bunch of signs to hold in pictures to send to our friends back home. I made the one below for my wife who had to sit this trip out. After a few hours or so at Everest, we headed back to Shegar and then made our way back to the city of Lhasa. It was another great trip across Tibet that I won't be forgetting anytime soon. Wow! What a trip! Thanks for taking me along! In my younger years I remember a few camping trips that involved trying to get moisture out of cups frozen solid!